BiuBiu is a Polish company specializing in clothing for a fuller bust. Clothing is fitted by waist and bust measurements. Each waist measurement has three accompanying levels of bust room: B, BB, and BBB. Clothing made of stretch fabric comes in two bust sizes, B/BB and BB/BBB. BiuBiu’s website is available in English, and offers estimates on the cost of the products in pounds, euros, and dollars. Both Paypal and credit cards are accepted as payment methods. Shortly before ordering I had the opportunity to try the Avila in size 42. I usually order BiuBiu clothing in size 40, sometimes 42, although I do own some clothing in 44. The 42 was a bit tight for me in the arms when I wore it over a long-sleeved shirt, so I ordered the jacket in 44B. The blazer I tried belonged to someone who routinely wears a 40. Her arms are much smaller than mine, so she found sizing up one size gave her ample room for thicker clothing underneath. The Avila costs 139.00 zł (about €36/£30/$49). The delivery of the item was typical for my orders with BiuBiu. It arrived after about a week and the package was undamaged. Shipping cost 40.43 zł (about €10). 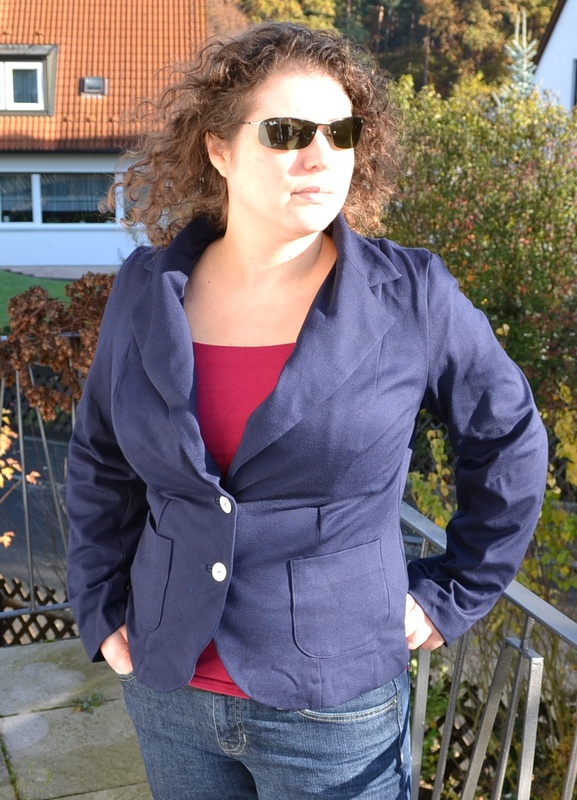 The blazer is made of an unlined navy blue fabric. A bit of floral fabric marks the edge of the lining. It has two pewter-colored buttons. 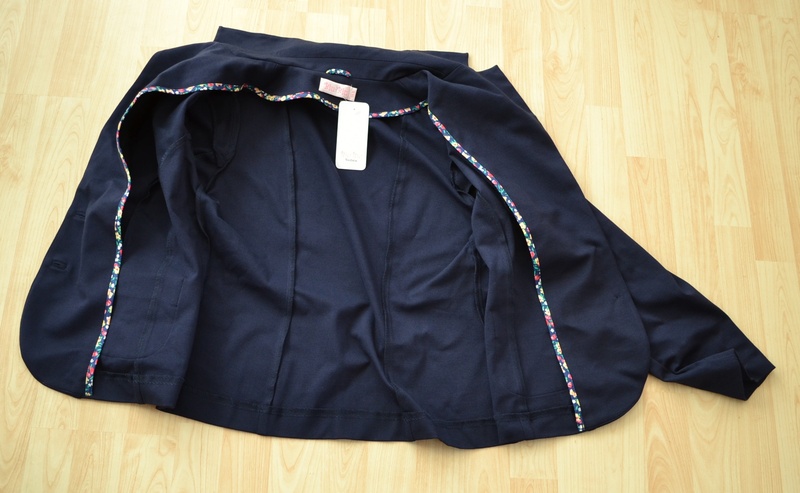 It has two small pockets. 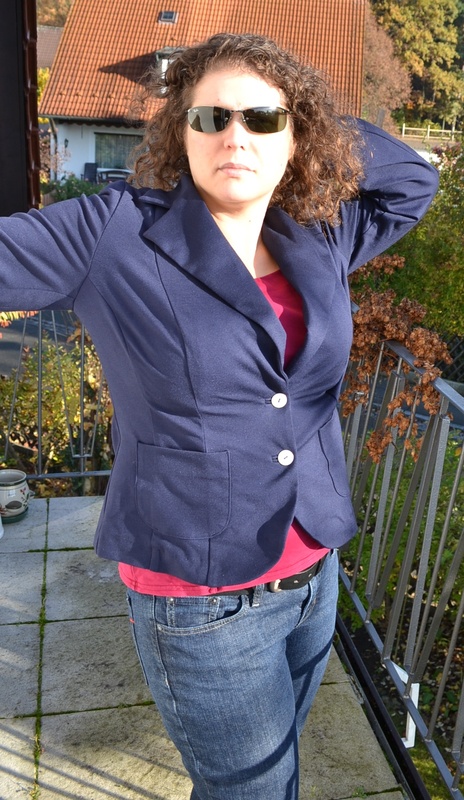 It’s a somewhat ordinary blazer of the sort I frequently paired with jeans before my breasts made that awkward. I’m glad to be able to return to that style, but I wouldn’t use the Avila to fill the role of a more formal blazer. The Avila is comfortable. The color, although less utilitarian than plain black, contrasts nicely with a red shirt. I have no complaints about the construction of the blazer. BiuBiu Avila: forgive the sunglasses; it was bright. The color is a little darker than shown here. As mentioned, I feel that the Avila runs small if you want to wear it over a long-sleeved shirt. If I had wanted to wear it with a lightweight blouse, I would probably have opted to go up only one size. However, I feel that this is a more casual-looking blazer, suitable for pairing with jeans, so I prefer to wear it with a casual shirt. 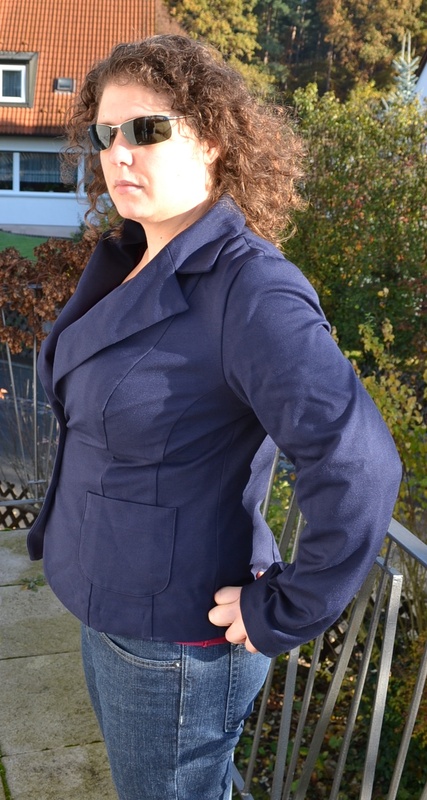 Unlike the previous blazer I tried, the placement of the underarm seam was more accurate for me. With my arms in use, it’s clear that it is a little wide–no doubt because of sizing up–but generally in the right place. It’s not as fitted in the body as I would have liked. Again, this is a symptom of sizing up. The biggest downside to sizing up was that the bust isn’t a very good fit. It is a bit too large, with some gaping at the top. It might also be a matter of placement, because if I pull it down or overtighten my bra straps, I can fill the space. BiuBiu products are generally a better fit for me than UKRYE clothing because they are designed with a more top-heavy figure in mind, while URKYE caters to an hourglass shape. In the case of the blazer, I was disappointed that neither product was a stunning success for me. Both are okay, and I certainly wear both (although I find the black one more useful), but neither is an ideal fit for me. I did not have to alter the blazer, as the sleeves, although a little too long for me, are not uncomfortably long. I’m always happy to see affordable full-bust companies expanding their range beyond dresses and shirts. I really wanted to like the Avila more than I do, because I have been unable to wear a blazer for a number of years. Unfortunately, the fact that I had to size up to prevent it from being too tight around my upper arms introduced a number of fitting issues which affected the appearance of the blazer.